A Missouri man is being held after he was caught allegedly trafficking methamphetamine. The man was stopped on a routine traffic violation by Goodwell’s District Task Force. Brian L. Masoner, 32, of Blue Springs, Mo. was stopped in a 1997 Toyota Avalon displaying Arizona plates for a lane violation on May 19, 2009 in Goodwell, Okla. According to a report in the Guymon Daily Herald, the Probable Clause (PC) Affidavit filed at the Texas County Court Clerk’s Office states Masoner was travelling through Goodwell, Okla., with a destination of Phoenix, Ariz., when he was pulled over by Agent Chris Bird. After discovering the Masoner had no valid drivers license only a Missouri identification card, Bird called for a K-9 unit. Officer Chan Boley arrived with the K-9 unit, the dog made a positive identification for the presence of narcotics in the vehicle. Once narcotic presence was positively identified, Agent Chan Boley and Agent Bird began the search of the vehicle and suspects. 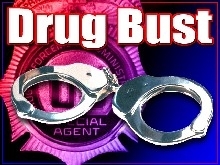 Agent Boley then did an officer pat down discovering a small Vivitar camera case containing three baggies of white crystal powder, baggies, scales, glass pipe and a small tin that contained white crystals, alleged to be 10 grams of methamphetamine. According to the affidavit Masoner was heading to Arizona to pick up approximately 20 to 30 lbs of meth for addition transport. Agent Bird located approximately $11,000 in U.S. currency in a false compartment that had been built between the trunk and back seat. Brian L. Masoner is currently being held at the Texas County Jail on four counts. Count one, conspiring to commit aggravated trafficking in an illegal drug, methamphetamine. A felony that is punishable by imprisonment for 15 years to life and or a fine of not less than $50,000 or more than $500,000. Count two, unlawful possession of controlled drug with intent to distribute methamphetamine. A felony that is punishable by imprisonment for two years to life and or a fine of up to $20,000. Count three, acquire proceeds from drug activity, a felony that is punishable by not less than two years nor more than 10 years in the state penitentiary and or a fine of not more than $50,000. Count four, unlawful possession of drug paraphernalia, a misdemeanor punishable by imprisonment for up to one year and or a fine of up to $1,000 or both. Masoner is being held at the Texas County Detention Center on a bond of $350,000.